Physics 162 - Physics II This course is a calculus-based introduction to physics. Students interested in majoring in physics, engineering, mathematics, computer science, or other sciences are likely to take this course. We concentrate mainly on electricity and magnetism and optics. Physics 302 - Physics IV This course is intended for physics majors and students interested in engineering. We cover vibrations and waves while developing skills in mathematics, computation, experimental techniques, and scientific writing. Physics 318 - Quantum Mechanics This course is intended for physics majors and students interested in engineering. We cover elementary quantum theory, which includes solving the Schrödinger equation in one and three dimensions. We also explore the formal aspects of quantum theory, and then finish the semester with a look at time-independent perturbation theory. Physics of Sports Click here for an article ("Not Just Bio 101") on my Physics of Sports course that appeared in the October 15, 2001 edition of the Crain's Cleveland Business Archives. Click here for another article that appeared in the November 1, 2001 edition of the Boston College Chronicle. * Gave an invited keynote address titled Olympic Dreams that Make Sports of Physics at The Engineering of Sport 9, which was the 2012 Conference of the International Sports Engineering Association, Lowell, MA, July 9-13, 2012. Click here for access to my PowerPoint slides for my keynote talk. I also gave two research talks at this conference, one titled Investigations into soccer aerodynamics via trajectory analysis and dust experiments and the other titled Predicting Winning Times for Stages of the 2011 Tour de France Using an Inclined-Plane Model. * Gave an invited talk titled Making Sport of Physics at the Summer Meeting of the American Association of Physics Teachers held at Creighton University, Omaha, NE, July 30 - August 3, 2011. * Gave an invited talk titled Making Sport of Physics at the National Science Teachers Association 2010 Area Conference on Science Education held in Baltimore, MD, November 11-13, 2010. * Gave talk titled Soccer Physics from Sheffield at the Fall Chesapeake Section of the American Association of Physics Teachers held at George Mason University in Fairfax, VA, October 8-9, 2009. My talk won the Frank R. Haig Prize for best paper from a four-year college. Click here for my PowerPoint presentation. 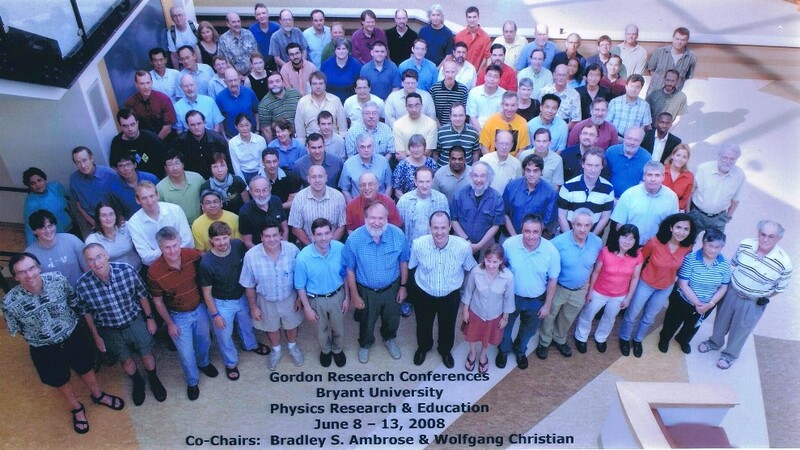 * Attended the Gordon Research Conference called Physics Research and Education held at Bryant University in Smithfield, RI, June 8-13, 2008. The focus of the conference was on computation and computer-based instruction. Click here for a conference photo (I am in the second row from the back, seventh over from the left.). * Gave talk titled Mathematica examples from the LC undergraduate physics curriculum at the Fall Chesapeake Section of the American Association of Physics Teachers held at Radford University in Radford, VA, November 2-3, 2007. Click here for my PowerPoint presentation. 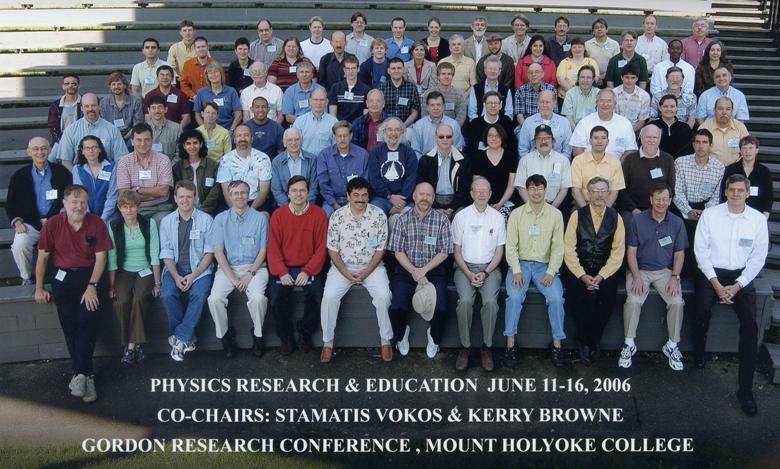 * Attended the Gordon Research Conference called Physics Research and Education held at Mount Holyoke College in South Hadley, MA, June 11-16, 2006. The focus of the conference was on electricity and magnetism. Click here for a conference photo (I am in the fourth row from the bottom, eighth over from the left.). * Gave talk titled Three-Year Study of Tour de France Modeling at the Fall Chesapeake Section of the American Association of Physics Teachers held at the American Center for Physics in College Park, MD, November 4-5, 2005. Click here for my PowerPoint presentation. * Attended the Gordon Research Conference called Nonlinear Science held at Colby College in Waterville, ME. 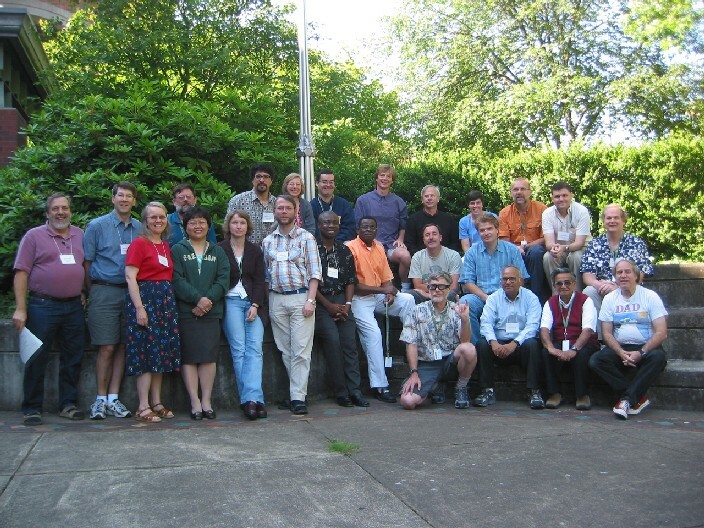 The conference was held June 26 - July 1, 2005 and brought together the world's leading experts in nonlinear science. Click here for a conference photo (To find me, begin at the bottom right. Count four heads to the left and then four going back.). * Attended the Activity Based Physics Faculty Institutes workshop at the University of Oregon in Eugene, OR. 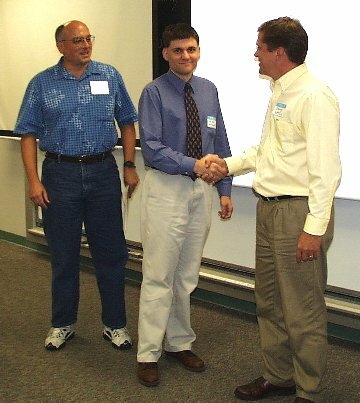 The workshop was held June 19-24, 2005 and focused on introductory physics teaching. Click here for a photo of the workshop group (I am on the far right of the back row.). * I arranged for Lynchburg College to host the 2005 Spring Meeting of the Chesapeake Section of the American Association of Physics Teachers. The meeting was held March 11-12, 2005; meeting details can be found here. I gave a talk titled Modern Application for Introductory Physics: Bloodstain Pattern Analysis. Click here for my PowerPoint presentation. Click here for a photo of me giving my talk and here for second photo. * Gave talk titled Check on Model Robustness: 2004 Tour de France at the Fall Chesapeake Section of the American Association of Physics Teachers held at Mary Baldwin College in Staunton, VA, November 5-6, 2004. My talk won the Frank R. Haig Prize for best paper from a four-year college. Click here for my PowerPoint presentation. The final two slides of the presentation are PDF files showing tables of results. Click here for the first and here for the second. * Attended the Computational Physics for Physics Educators workshop held at Centenary College in Hackettstown, NJ, July 11-17, 2004. 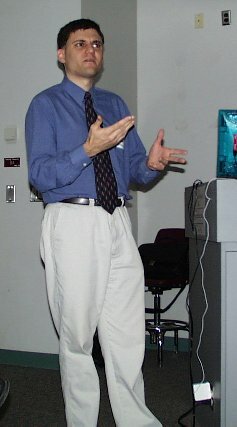 The workshop was run by the National Computational Science Institute and focused on the use of computational techniques in physics education. 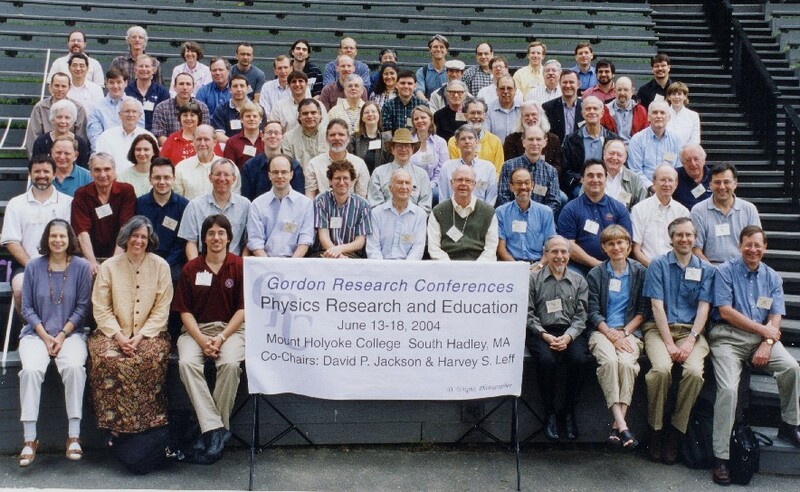 * Attended the Gordon Research Conference called Physics Research and Education held at Mount Holyoke College in South Hadley, MA, June 13-18, 2004. The focus of the conference was on classical mechanics and nonlinear dynamics. Click here for a conference photo (I am in the fifth row from the bottom, seventh over from the left.). * Completed the National Science Foundation Chautauqua Short Course "Data Analysis and Visualization Using Mathematica" held at Christian Brothers University in Memphis, TN, May 16-18, 2004. * Gave talk titled Model of the 2003 Tour de France at the Spring Chesapeake Section of the American Association of Physics Teachers held at the National Science Foundation as part of the Washington Academy of Sciences Capital Science 2004, March 20-21, 2004. My talk won the Frank R. Haig Prize for best paper from a four-year college. Click here for my PowerPoint presentation. I got to meet and chat briefly with President Bush's science advisor, Dr. John Marburger, III. He served as Director of White House Office of Science and Technology Policy. 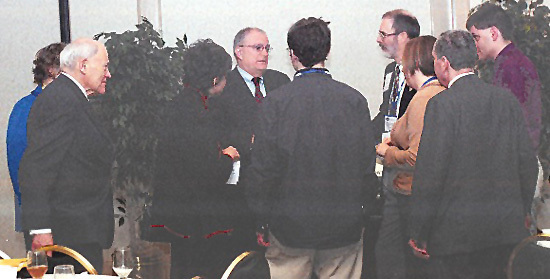 Click here for a photo of Dr. Marburger talking to conference participants; I am on the far right waiting to introduce myself. 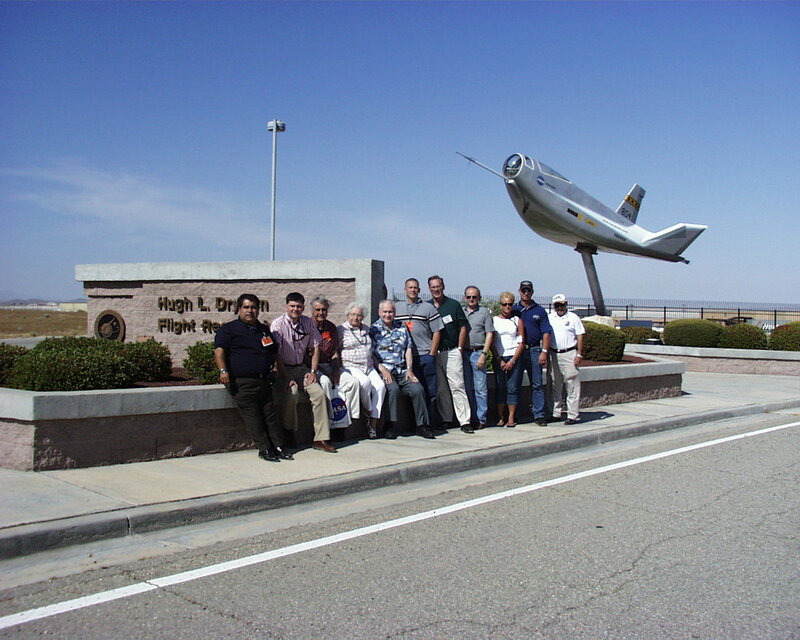 * Completed the National Science Foundation Chautauqua Short Course "The History and Future of Aeronautics" held at NASA's Dryden Flight Research Center on Edwards Air Force Base in Edwards, CA, June 11-13, 2003. Click here for a picture of my Chautauqua class (I am the second from the left.). * Attended the Workshop for New Physics and Astronomy Faculty held at the American Center for Physics in College Park, MD, November 7-10, 2002. * Attended the Workshop on Opportunities in Materials Theory held jointly at the National Science Foundation and Georgetown University, October 14-16, 2002. * Gave talk titled A FUN General Education Course: Physics of Sports at the Fall Chesapeake Section of the American Association of Physics Teachers held at Radford University, October 4-5, 2002. My talk won the Frank R. Haig Prize for best paper from a four-year college. Click here for a picture of me giving my talk. Click here for a picture of me receiving the best paper award. Click here for my PowerPoint presentation. My current research work is in a couple of areas. I have an interest in the physics of sports. My first book, Gold Medal Physics: The Science of Sports, is pitched at a level that does not exceed introductory physics. I cover great moments in sports: "The Play" from Cal's win over Stanford in 1982, Doug Flutie's "Hail Mary" pass in 1984, Lance Armstrong's incredible Tour de France feats, Bob Beamon's epic jump in 1968, Greg Louganis' (shown on cover) gold-medal diving in 1984 and 1988, Katarina Witt's majesty on ice, David Beckham's banana kicks in soccer, Al Oerter's Olympic dominance in the discus throw, and Taiho's legendary sumo triumphs. I also unveil a College Football Prediction Contest. * Read what Publisher's Weekly had to say on my Amazon page here. * Work I did with Matt Carré is described in a November 19, 2009 article on the ControScienza blog titled "Analisi della traiettoria di un pallone da calcio" ("Analysis of the trajectory of a soccer ball"). Click here for a link to the article (Italian). * I was interviewed by the local ABC news affiliate on December 31, 2009. Click here for the story. * Click here for the Page 99 test of my book. * I did a live 12-minute interview on Tuesday, January 12, 2010 on the Pete & Brenda in the Morning radio show. * I did a 14-minute radio interview with WMAN 1400 AM radio in Mansfield, Ohio. The interview ran on Tuesday, February 9, 2010. Aaron Hines conducted the interview for The Sports Grill. Click here for an MP3 of the interview. * Click here for an article about me and the physics of Olympic sports in the Friday, February 12, 2010 edition of the Appomattox News. * I did a live 12-minute radio interview with WILS-AM radio in Lansing, Michigan on Friday, February 12, 2010. Jack Ebling conducted the interview. Click here for an MP3 of part 1 of the interview and here for an MP3 of part 2. * The Wall Street Journal made use of calculations I did connected to athletes executing jumps and spins in a February 17, 2010 article titled "Air Abbott? Skaters Rival Sports Legends With 'Quad' Jumps." Click here for a link to the article. A longer version of that article, called "Four! Figure skaters Tee Up the Quad," appeared the same day. Click here for the link. * I did a live 15-minute radio interview with KXYL FM-96.9 radio in Brownwood, Texas. The interview ran on Wednesday, February 24, 2010 and was part of The Big Show. Click here for an MP3 of the interview. * I commented on the aerodynamics of sports balls in a June 8, 2010 article on Inside Science titled "Stability of New World Cup Ball Tested." Click here for a link to the article. When Fox News picked up the article, I was incorrectly listed as affiliated with the University of Virginia. * The University of Sheffield issued a press release on June 17, 2010 on the work I did with Matt Carré. The article is titled "Researchers investigate spin of World Cup football" and may be found here. * DPA on the Net published an article on June 26, 2010 describing the work I did with Matt Carré. The article is titled " 'Spin' doctors study the aerodynamics of football" and may be found here. * The Wall Street Journal made use of calculations I did connected to space created via reaction time in soccer and basketball in a June 26, 2010 article titled "Messi, Like LeBron, Defies Physics." Click here for a link to the article. * A Singapore paper, The Electric New Paper, picked up the above story and put their own spin on it for a June 28, 2010 article (link no longer available). * The Wall Street Journal made use of trajectory calculations I did for the final eight teams of the 2010 World Cup in a June 30, 2010 article titled "The Anatomy of a World Cup Goal." Click here for a link to the article. * Deseret News commented on my research in a June 30, 2010 article titled "Dimpled golf balls travel farther." Click here for a link to the article. * Read what the July 2010 issue of Choice Reviews had to say about my book here. * Science Codex picked up on my soccer work in a July 1, 2010 story titled "Study explains science of soccer." Click here for a link to the article. The same article appeared here at PHYSORG on the same day. * Scientific Blogging had a July 1, 2010 article titled "Science of Soccer Balls - Houston, We Have A Drag Crisis" that featured my soccer research. Click here for a link to the article. * The Hindu published a July 2, 2010 article on my soccer research titled "The physics of bending it like Beckham." Click here for a link to the article. The same article ran in The Times of India (link no longer available). * Indian Express published a July 2, 2010 article on my soccer research titled "Football aerodynamics explains great moments?" Click here for a link to the article. * Thaindian News published a July 2, 2010 article on my soccer research titled "Here's soccer through the lens of science." Click here for a link to the article. * Inside Soccer World published a July 3, 2010 article on my soccer research titled "How miraculous things happen with soccer ball." Click here for a link to the article. The same article, with a slightly different spin, appeared in a July 4, 2010 article in World Cup Football (published in the Cocos Islands). Click here for that article. * UPI published a July 6, 2010 article on my soccer research titled "Physics laws lead to super soccer plays." Click here for a link to the article. * The Italian news service WIRED.IT published an article on my recent work and my work with Brandon Cook in a July 7, 2010 article titled "Gol su punizione? Uno su dieci" ("Fee kick? One in ten") and may be found here (Italian). * Four minutes of an interview I did with National Public Radio ran on the Weekend Edition Sunday show on July 11, 2010. Click here for an MP3 of the interview. The NPR article "What Physics Says About Smooth Balls" can be obtained here. The transcript is available here. * My work was discussed in Darrell Laurant's column for the Monday, July 12, 2010 issue of the Lynchburg News & Advance. The article was titled "On immigration, Irish heritage and World Cup physics" and may be found here. * Oklahoma's NewsOK discussed my work in "Strange But True," a science piece published on Tuesday, July 20, 2010. Click here for a link to the article. * The Wall Street Journal made use of calculations I did for two NFL running backs in an August 19, 2010 article titled "Humiliation Comes in Two Flavors." Click here for a link to the article. * The online magazine Sportales published a September 22, 2010 article on my work titled "Soccer Through the Eyes of Science." Click here for the article. * A nice review of my book from September 25, 2010 can be found here at Epinions. * I contributed commentary and calculations to a story titled "The Science of Hitting Home Runs" in the April 2011 issue of OWL Magazine (Canada). * On July 28, 2011, I was interviewed by Bruce Berglund of New Books in Sports, which is part of the New Books Network. A brief story behind the interview may be found here. The 62-minute interview became available at the New Books in Sports website on August 24, 2011. It is also available on iTunes here. Click here for a direct download. * I analyzed Joe McKnight's blocked punt in the Jets win over the Cowboys on September 11, 2011. Click here for the article in YAHOO! SPORTS by Kristian Dyer that appeared on September 14, 2011. * I analyzed Tim Tebow's sidearm throwing motion and how it connects to the range of his long throws. Click here for the article in YAHOO! SPORTS by Kristian Dyer that appeared on December 6, 2011. * I analyzed the two plays that made the difference in Super Bowl XLVI. Click here for the article in YAHOO! SPORTS by Kristian Dyer that appeared on February 7, 2012. * I analyzed Danilo Gallinari's amazing behind-the-back pass. Click here for the article in YAHOO! SPORTS by Kristian Dyer that appeared on March 22, 2012. An Italian take on this story appeared in the May 9, 2012 edition of il Cittadino. Click here for the story titled "Un fisico studia un assist del Gallo." * Click here for an article in Lowell, Massachusetts that appeared on June 15, 2012 and describes my appearance at the 2012 ISEA conference. * Click here (or here) for an article in The Boston Globe that appeared on June 24, 2012 and describes my appearance at the 2012 ISEA conference. * I was invited to write a blog post for the Johns Hopkins University Press on Tour de France modeling. Click here for the guest post I wrote for June 29, 2012. * Click here for an article in the July 12, 2012 issue of the Lowell Sun that contains an interview with me while I was attending the 2012 ISEA conference. * Click here (or here) to listen to John Ingoldsby interview me for the July 13, 2012 broadcast of All Around Sports. My interview begins at 13:46 and runs through 19:18. * I provided calculations and commentary for the August 2012 issue of Outside magazine. The article I worked on is called "Short White Man Can Jump" and concerns US Olympic high-jumper Jesse Williams. Click here for a link to the article. * I was invited to write a blog post for the Johns Hopkins University Press on seeing the Olympics as a physicist. Click here for the guest post I wrote for July 27, 2012. * I gave commentary and analysis to an article called "Bigger Tebow not a good fit for Jets" about Tim Tebow and his increased weight. Click here for Kristian Dyer's article in the December 30, 2012 edition of Metro -- New York. * Lots of my analysis and commentary appear in the article "QB guru: Geno Smith struggling with mechanical flaws," written by Kristian Dyer for the September 17, 2013 edition of Metro -- New York. Click here for the article. * I contributed physics commentary for the Scientific American story "Getting on the Ball: How the FIFA 14 Soccer Video Game Finally Got Its Physics Right," which appeared September 27, 2013 and was written by Julianne Chiaet. Click here for the article. *Lots of my analysis and commentary appear in the article "New York's cold-weather Super Bowl will affect physics of the game," written by Kristian Dyer for the January 28, 2014 edition of Metro -- New York. Click here for the article. The story was picked up by the International Science Times (click here for the article) and the Smithsonian (click here for the article). I spent my first sabbatical (2008-09 academic year) as a member of Matt Carré's Sports Engineering Research Group at the University of Sheffield in England. I developed codes to extract drag and lift coefficients from trajectory data of soccer balls (non-spinning and spinning) in flight. Some of the lift coefficients Matt and I found are for spin parameters not yet tested in today's wind tunnels. A nice write-up of our work appears in the November 2009 issue of Physics World. Click here for the story. Brandon Cook, who graduated from Lynchburg College in May of 2007, worked with me on a project that involved determining rules of thumb for successful soccer kicks. We examined the free kick and the corner kick. During the summers of 2003 and 2004, I worked with Benjamin Lee Hannas (LC '03) on a model that predicts stage-winning times in the Tour de France. Our models did quite well; we missed the overall time in 2003 by just 0.03% and the overall time in 2004 by just 0.05%. Our Tour de France work was the subject of a newspaper article that appeared in the July 14, 2005 issue of the Richmond Times-Dispatch. Click here for a copy of the article. During the summer of 2007, LC physics major Crystal Moorman worked with me on a project dealing with computational gravity. Before the summer got going, we published a paper that dealt with the golden ratio in a coupled-oscillator system. As a long-term project, I am learning what is called the finite-difference time-domain (FDTD) method. FDTD is a popular method in computational electrodynamics. In the original version, the buoyant force on a baseball has been incorrectly published as 1.5% of the ball’s weight (found between Eqs. (6) and (7)). The correct buoyant force is 0.15% of the ball’s weight. At the end of the third paragraph in Section 4.10, the distance 2.63 m was incorrectly converted to 0.802 ft. Please replace 0.802 ft with 8.63 ft. I kindly thank Louis Poirier for pointing this typo out to me. Power and spin in the beautiful game, John Eric Goff, Physics Today 63 (7), 62-63 (2010) (invited). (PDF version) This article was translated into Japanese for the July 2011 issue of Parity. Click here for a PDF version of my paper in Japanese. Gold Medal Physics: The Science of Sports, John Eric Goff, The Johns Hopkins University Press (Baltimore, MD), 2010. ISBN: 9780801893216 (hardback), 9780801893223 (paperback). My thesis research at Indiana created a theory for the photon-drag effect in simple metals. Under the direction my advisor, Bill Schaich, my work represented the first fully quantum-mechanical calculation of the static second-order surface response. Now, what is photon drag? Well, when light hits a metal, some of the light's momentum is transferred to the metal upon reflection. Free electrons pick up that momentum ("dragged" by the light) and currents are established parallel to the metal's surface. The light cannot go too far into the metal, so the electrons are pushed only a little ways perpendicular to the surface (that leads to a voltage). This web page and its content and opinions are the sole responsibility of John Eric Goff. Lynchburg College is not responsible for the content or opinions found on this page.